Chemical resistant flooring 09 96 35 is a perfect solution for concrete floors that demand protection from chemical spills can be treated with a chemical resistant floor coating or topping. Plus, many times chemical resistant flooring also requires waterproof, slip resistant and even anti-static properties added to the floor coating to create the most functional industrial and commercial flooring system. Concare designs custom concrete floor protection solutions to withstand harmful acids 09 62 35, caustics, oils, solvents and even cleaning solutions that can cause deterioration and erosion of concrete. Our chemical resistant flooring solutions eliminate the worry about groundwater or soil or structural contamination from chemicals used or stored in your facility. This is important to industrial and manufacturing facilities as chemicals are an essential element of many production processes. 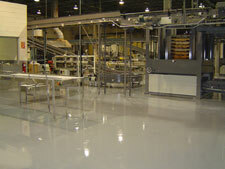 Businesses in IL, MI, IN, IA, WI rely on Concare for chemical resistant flooring. Our high performance flooring systems are durable and long lasting; our installation techniques have been proven over years of experience. The investment made into a chemical resistant flooring installed by Concare will save you from the cost of repairs for years to come and will protect your facility asset, the concrete underneath, from contamination. Contact us today to find out how you can protect your floor from harmful chemical with our chemical resistant flooring.